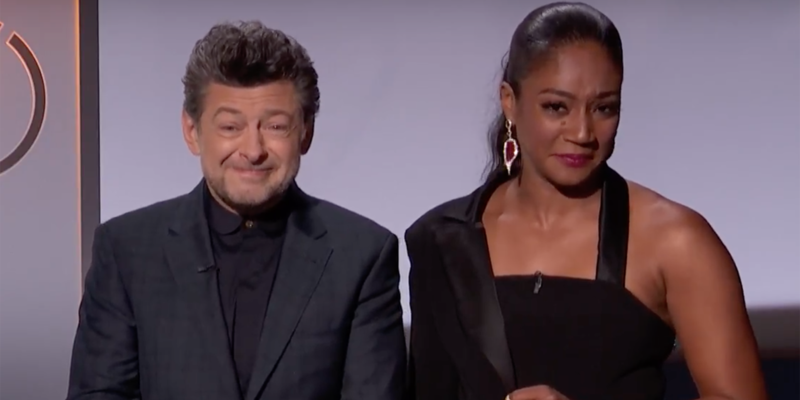 Tiffany Haddish and actor Andy Serkis announced the 2018 Oscar nominations this morning, which was especially great because Haddish hilariously mispronounced so many actors’ names and elevated the nomination announcements into a must-see live event. However, having both Haddish and Serkis read the list of nominated actors was cruelly ironic in a way, because both were snubbed by the Academy. Serkis is the motion caption actor in literally all of your favorite movies (Caesar in the Planet of the Apes series, Gollum in The Lord of the Rings, Kong in King Kong) and has been serving up glorious performances for most of his career. Yet he has never been nominated. As for Haddish, show us another performance by a woman this year as memorable as her breakout role in Girls Trip. There were so many powerful film performances by women in 2017, but none that had you talking and tweeting and texting your friends like you did after you watched Haddish do her thing. Many will argue that Girls Trip is a raunchy comedy and therefore not Oscar caliber, but don’t forget about Bridesmaids in 2012. Bridesmaids was nominated for two Oscars: Best Original Screenplay and Best Supporting Actress for Melissa McCarthy. Many people are comparing the roles because both Haddish and McCarthy gave breakout comic performances in broad R-Rated comedies about a group of women. As for Haddish’s Oscar snub, Twitter has weighed in with opinions. Bringing out Andy Serkis and Tiffany Haddish for the #OscarNoms ist like bringing out Amy Adams as a presenter the year she was snubbed. @TiffanyHaddish ya got snubbed. You were the best thing this year. Some are frustrated that she was shut out of both the Golden Globes and, now, the Oscars. Others are echoing our comparison to McCarthy’s nomination for Bridesmaids. Haddish, however, had the best reaction to her own snub. She retweeted this fan who joked that had she been nominated, she would have mispronounced her own name. We don’t deserve this woman.